Make Sure to See Your Dentist Before the End of the Year! You probably have a lot on your mind as the end of 2017 approaches. Maybe you’re gathering all of your paperwork before you file taxes in January, or you might have a thousand things to do to prepare for holiday gettogethers with your family. Visiting your dentist in Sapulpa might be the furthest thing from your mind. However, you should never forget how important caring for your teeth is! Scheduling an appointment before December 31 can benefit both your oral health and your wallet. If you’re fortunate enough to have dental insurance through your job, you should be sure to use it. After all, it is a waste of money for you and your employer if you don’t take advantage of your coverage. Your benefits will mostly likely expire on December 31, which means you don’t have a lot of time left to get the most out of your policy. Scheduling an appointment can be especially beneficial if you’ve already met your deductible; you could get some dental work done for free or almost free, depending on the fine print of your insurance policy. You might be able to save even more if you go to a dentist who is in your coverage provider’s network. To be “in-network” simply means that your dentist has pre-negotiated with your insurance company, settling on prices for treatment that save you money. At your dentist in Sapulpa, we are in-network with several major providers — why not call and ask if we work with your insurance company? Even if you do not have coverage or we aren’t in your provider’s network, we’ll be happy to discuss payment options with you. Our priority is to help you have a healthy, beautiful smile. You might hesitate to schedule an appointment, not because of the financial aspect, but because you simply don’t think it’s worth your time. After all, your teeth might look fine and not be in any pain. However, keep in mind that a professional will be able to spot problems before you do, and tackling such issues early on will save you time, money, and frustration. 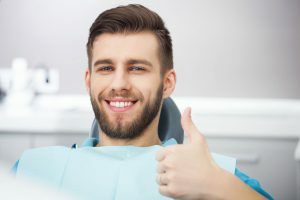 Even if your mouth is perfectly healthy, going to the dentist is still a good idea — you’ll feel nice and fresh after you get your teeth professionally cleaned! Your cosmetic dentist in Sapulpa would love to see you before the doors close on 2017. Why not schedule an appointment soon? Your teeth and your budget will thank you. At Complete Cosmetic Care Dentistry, we want nothing more than to help our patients have excellent oral health and attractive teeth that they can be proud of. If you have questions about your oral health, the payment options we offer, or why routine dental visits are so important, please contact us at 918-216-1000. Comments Off on Make Sure to See Your Dentist Before the End of the Year!